The KM "proof of concept"
In the early stages of Knowledge Management – even when you are still drafting the Strategy – you may need to deliver a “Proof of Concept” exercise. 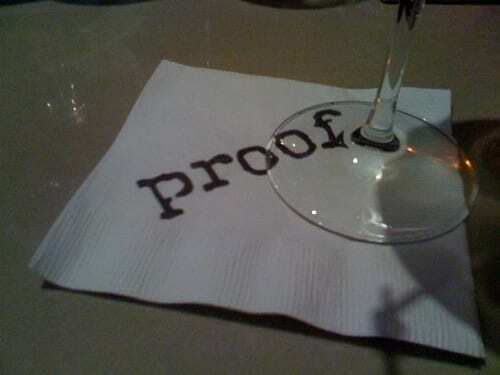 Proof of?, a photo by katmeresin on Flickr. This is a small intervention with a Knowledge Management tool or process, just so that people can see it in action, and to show that “Yes, it can work here. No, it’s not all smoke and mirrors”. This is not the same as a full-scale pilot, nor is it part of implementation – it’s a “Look at this” exercise. A retrospect on a tricky (or successful) project. For one of the companies we have worked with this was a project that had gone disastrously wrong, and they effectively said to us “if you can get learning from this project, then we will believe what you say about Knowledge Management. We did, and they did. A Peer Assist for a high profile project. This has been the proof of concept for many companies – a straightforward demonstration that valuable knowledge can be shared between projects teams, and can make a positive impact to project plans. A Knowledge Exchange on a key topic. For another organisation, the proof of concept was getting experts together from all over the world to build company Best Practice on bidding and winning PFI contracts. A retention interview from a departing expert. This has been the proof of concept for many a Retention strategy. Management want to see what is possible, and they want to see the output, in order to prove that retention can generate valuable output. In each case, you should seek to create two things from the Proof of Concept. The second is stories, or feedback from the people involved, saying “Hey, we tried this knowledge management thing, it was great, it was not difficult, and it created real value”. Why do so many KM implementations not learn from the past? Why is it that so many KM implementations never seem to learn the lessons of the past? We know by now what makes KM work. 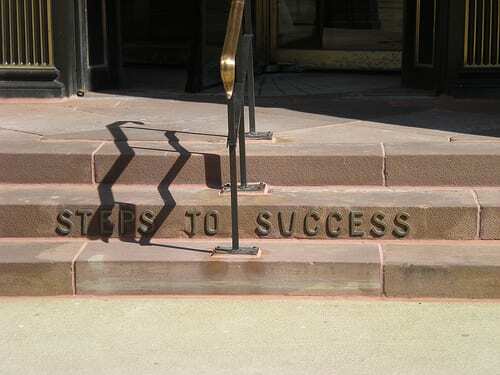 We know the 7 secrets of success for KM, and the 7 most common reasons for failure. We know the principles, we know which KM strategies succeed and which ones fail. So why is it a sad fact that so many KM implementations continue to fail? People who own KM initiatives are human beings, and as prone as other human beings to rush in without “learning before”. So they reinvent the wheel yet again. That’s why KM is needed in the first place – to influence people to value and to access and ro reuse knowledge, because this is not natural human behaviour; not even for the KM implementors. People are prone to the common fallacy that “we are different – the lessons of the past do not apply to us” (the “we are different” fallacy is one of the 5 most common objections that you have to face as a KMer). Sometimes this is expressed as “people these days (Gen Y, Gen Z, whatever) are different – the lessons of the past will not apply to them”. Still a fallacy I am afraid, though one that KMers are prone to as much as anyone else. KM is simple, but difficult. 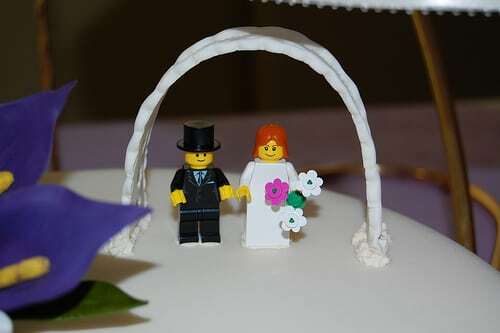 It is very tempting to go for a mixture of an easy option and wishful thinking, though the easy option will fail. The illusion of knowledge is one that applies to all humans. People will offer you miracle solutions – usually technology solutions. “Buy our software, and knowledge will manage itself”. 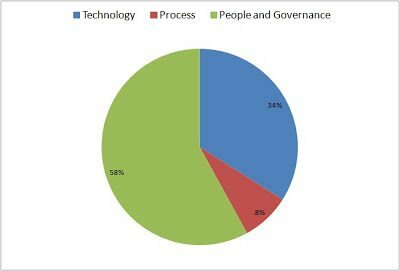 In 20 years of knowledge management, technology has never been the solution (though it has always been part of the solution – about 25% of the framework is technology). Believing that it will save you this time, is wishful thinking again. There is a lot of pressures from management to do KM on the cheap, quickly. and with minimal disruption. Unfortunately KM requires investment, it requires time, and (being a change process) causes disruption. You can fail quickly cheaply and non-disruptively, but you can’t succeed. It’s your job, as a KMer, to show management the investment of time and money that will be needed, and the value that KM will deliver in return. Be strong – make your case. Maybe you don’t know which lessons to trust. There are many dissenting voices in KM, and many people who will tell you many different things. In the past KM has no “authoritative voice”. Now at least we have the ISO Standard 30401:2018; the Management System standard for KM, and part of the reason this standard was written was to help people avoid the pitfalls of the past. If you do nothing else in your new KM program, buy the standard and use it as a guide. KM does work, when the KMers learn and apply the lessons from the past. The successes and the failures of past KM programs have generated a wealth of knowledge about the effective application and implementation of Knowledge Management. This is knowledge of huge value to you. Use that Knowledge, ladies and gentlemen. Others have striven to generate that knowledge, so that you, if you can avoid the temptations listed above, can guarantee success. 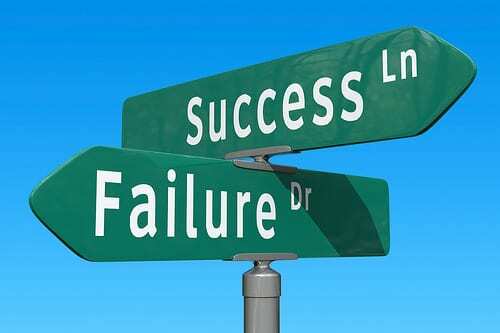 It’s always good to cross-check our KM programs against lists of failure and success factors. Here are two pretty comprehensive lists. More recently I came across this 2007 article entitled Addressing Failure Factors in Knowledge Management by Rosina O. Weber, which is an analysis of KM failure factors through a literature review, and which therefore provides a similar overview of success and failure factors. However the lists come at the issue from different angles – the Knoco list looks mostly at errors in KM implementation, Rosina’s list looks mostly at errors in the KM solution or approach. Here are Rosina’s 15 failure factors. 3. The KM team “preach only to the choir”. (Rosina’s number 2, although even she neglects the importance of governance).3. KM needs to address Pull as well as Push. (Rosina’s number 11, I think).6. KM needs not just high level support, but high level expectation. My advice to the KM professional is to look at Rosina’s lists and at my lists, and use these to drive a risk analysis of your Knowledge Management implementation. The more of the failure factors you recognise in your own approach, the higher the risk you face. Here is some more detail around each of these five steps (and if you need even more detail, read my book “Designing a Successful KM Strategy“). An assessment of the current KM system (and by system we mean processes, roles, governance, technology) to see what’s missing. A gap analysis, if you will, and the KM implementation program will largely seek to fill the gaps, and connect the unconnected elements. When you are conducting an assessment, make sure you talk to stakeholders at all levels. As my friend Lisandro Gaertner pointed out to me “listen to a lot of people’s stories about how they share knowledge and what are the outcomes they get. Sometimes people use cold (but apparently logical) assessment tools, interview mostly the wrong people (middle management and up) and get a fake glimpse about the KM culture. I don’t have to say to you that it is the recipe to failure”. Your Assessment (Step 1) should have been planned with a Framework in mind, and will have identified the gaps which need to be filled. we are calling this a “draft framework” at the moment, as the framework will not be finalised until after piloting. Why hasn’t knowledge management caught on? Wrong question! Very often we hear people talking about the failure of KM as a discipline, and asking “Why hasn’t it caught on after all these years?” It’s an interesting question, but it’s the wrong question. It’s an interesting question, but it’s the wrong question. People asking the question are often in government or the public sector, and there KM has not yet “caught on”. However there are other sectors where KM has caught on, and has delivered sustained value for a couple of decades. The consulting sector, for example – early adopters of KM, where KM is embedded, institutionalised, and part of the unconscious fabric of working. Or the legal sector, who’s own document-focused brand of KM is well established. Or the oil and gas sector. Ot the construction sector. Aerospace. The military. etc etc. 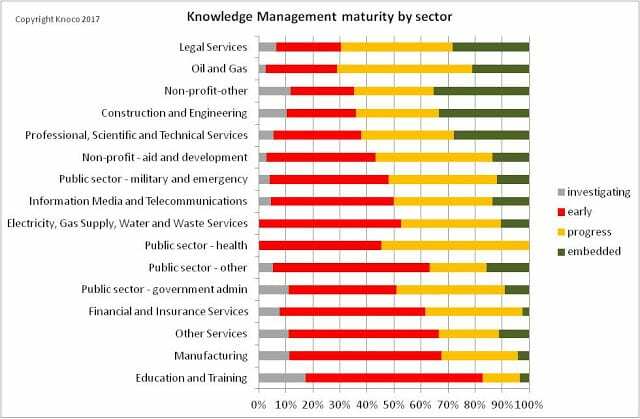 The plot above shows the maturity stages of KM in various industries, with far more examples of KM fully embedded in legal firms, for example, than in education and training firms. The plot below also shows that the larger the organisation, the more mature KM is likely to be. So the question is not “Why hasn’t KM caught on” but “Why hasn’t KM caught on in my organisational sector, and in organisations oy my size”. I think there are several reasons why KM has not yet caught on in the public sector in particular, and many of these can be related to the presence or lack of the components of organisational learning culture. KM catches on most easily where knowledge has the biggest and most immediate impact on performance. If you can see, and measure, the added value of knowledge (on cost, speed of delivery, bid win rate, whatever) then good KM, leading to an improvement of the delivery of knowledge to the decision makers, delivers immediate and visible value. In the public sector, performance is a very difficult concept to work with. What makes up “good performance” for a public sector organisation? How easy is that to measure, and how easy is it to tie back to knowledge? 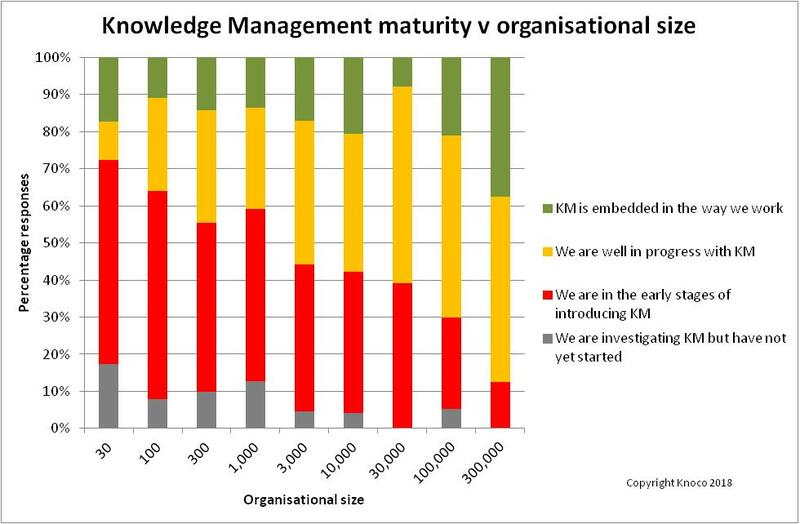 The value of KM certainly is more visible in larger organisations. Big multinationals have the most to gain from KM, and learning from their big-money decisions in multiple countries can deliver big benefit. In smaller organisations the benefits are correspondingly smaller and less visible, even though the proportional benefit may be the same. Where I have worked with public sector institutions, one of the things that struck me most forcefully was the way messages were managed. There seemed to be a lot of reworking documents, to make sure they said things in the correct way. Now there’s nothing wrong with that per se, but it introduces barriers to empowerment, to transparency, and to other elements of the required organisational learning culture. There is a distinct lack of “no blame” in the public sector, this time due to external pressures. All over the world (or almost all over), there is a hungry press waiting to pounce on anything that looks like a mistake or a failure from a government body or a national health service. This makes “learning from failure” a very risky affair. 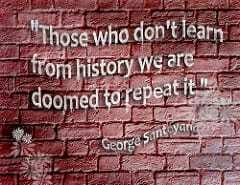 Indeed, the default approach to learning from failure is the dreaded “public enquiry”, after which someone will be sacked, someone will retire in disgrace, and the true reasons for failure will remain unfixed. The “just culture” is very hard to apply in a situation like this. So there are some real structural and cultural reasons why KM is not so easy in the public sector. In addition, where I have seen it, it tends to be focused on the tactical issues, and seldom on the strategic issues. 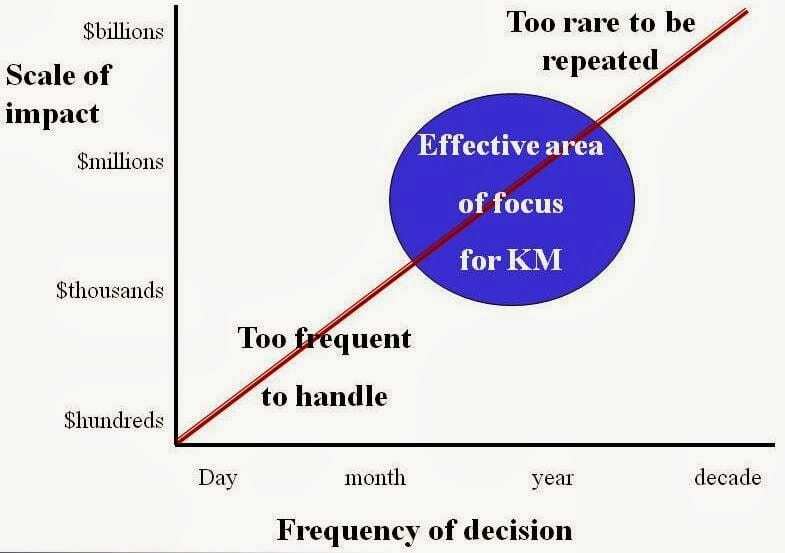 However, whether you sit in the public or private sector and are pondering “Why does KM seem to be dead? Why hasn’t it caught on?”, then you are asking the wrong question, because in other places KM has caught on and is alive and well. You need to learn from where it works, and see what’s different about your own context. And make adjustments as needed. How long does it take to implement KM? Knowledge Management can be started quickly, but takes a long time to fully embed. Here are two sources of data that show exactly how long. Over the past few years we have helped many organisations to benchmark their “current status” of Knowledge Management. They ask for this for a number of reasons. Sometimes they want to see where they need to improve. Sometimes they need to see IF they need to improve. Sometimes they need to set a benchmark so they have something they can measure future improvement against. The benchmark is a measure of the level of completeness and application of their knowledge management framework. The first trend appears when you look at how the overall benchmark score varies with the length of time KM has been addressed by the organisation. 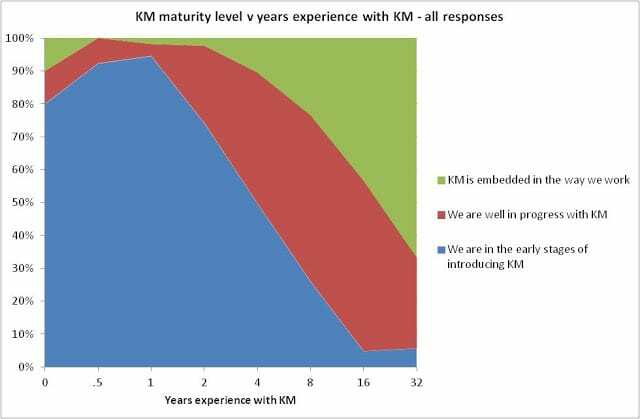 The graph above shows the overall KM score (from zero to 5) for about 25 organisations, plotted against how long they have been deliberately working with KM, in years. Bear in mind four things when you look at this plot. not all organisations want to score 5 out of 5, and 4 out of 5 is a pretty fine score. every company starts at a different level. Knowledge Management is something that mos companies do some of, without even trying. There is a big range of scores on organisations who are just starting KM implementation. If you already have a collaborative, open and supportive culture, you start at a higher point, and get good pretty quickly. If your culture is hierarchical, blaming and closed, it’s going to be a much longer journey. the people who call us in are often “stuck” in their KM efforts. That’s why they call us in. So “low scoring” companies will be over-represented here. 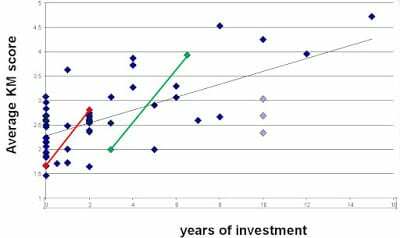 However also note on the plot the two red points joined by a red line, which represent the same organisation measured at an interval of 2 years, showing good progress. 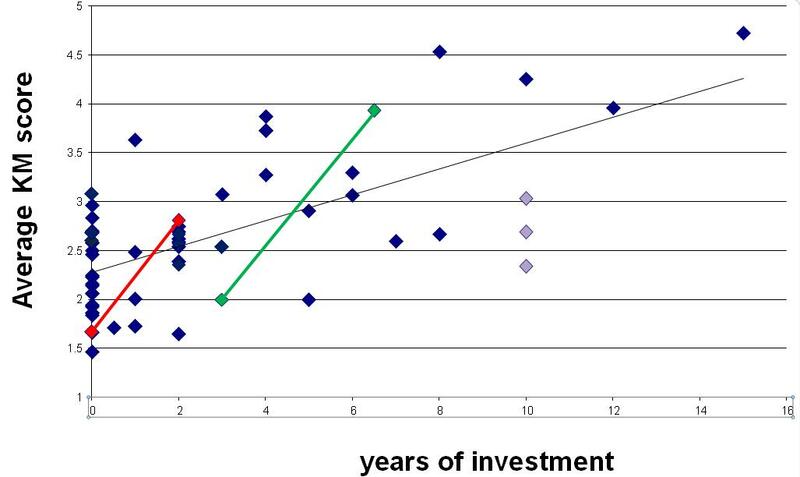 Similarly the two green points joined by a green line represent a different organisation, measured twice, at a 3.5 year interval, showing a similar rate of progress. Firstly, fully implementing Knowledge Management is a slow process. The earliest a company has reached level 4, from this dataset, is 4 years. The black line suggests an average of 14 years to get to level 4. Secondly, you can speed up your implementation. The black trend line represents “natural drift” towards Knowledge Management, while the red and green lines bot represent a deliberate, focused and resourced KM implementation program. If you followed the red line trend, you could start at level 2 and get to level 4 in about 3 years. Lets compare these figures with a different set of date, from our surveys in 2014 and 2017 (copies of the report available from the Knoco website), as described in this blog post from a year ago. The blog article breaks these data down further, showing that KM implementation is quicker in smaller companies, and slower in larger, but the overall conclusions are the same from both graphs shown here. KM a journey, it’s a slow journey, the fastest you will get there is about 4 years, different organisations start from different places, but faster progress can be made if you pay attention to implementing Knowledge Management as a project. One of the articles in this study, by Marleen Huysman and Dirk de Wit, discusses an analysis of KM implementations in several firms, and contains a section entitled “Identifying Traps and Ways to Avoid Them”, summarised by the table below. Clearly, for managers there are several advantages to managing knowledge within the organization…. Management books and articles demonstrate a growing awareness that the intellectual capital of the corporation is usually worth much more than its tangible book value.. (However) because managers cannot force people to share their knowledge, knowledge management calls for support of knowledge workers. Knowledge management heavily depends on the willingness of knowledge workers to take part in it. The management trap also relates to the bias to introduce knowledge management based on opportunity-driven arguments only rather than on problem-driven arguments. We saw that knowledge management will be more successful when it addresses existing situations and problems than when it is seen as an opportunity for organizational change. This post from the archives describes a strange statement from a client, and some of the thoughts it raised for me at the time. By “getting married” he meant that the company in question was now formally intending to make Knowledge Management “part of the household”, or an embedded component of how they do business. You are not sure whether Knowledge Management would suit your company but you are definitely interested. You get the idea that there might be something there – that you might find something of value if you explored a little further. You are reading about the topic, you are following some of the blogs, attending the conferences, maybe holding some internal conferences or seminars. Maybe you set up your first KM task force, and run a KM assessment. 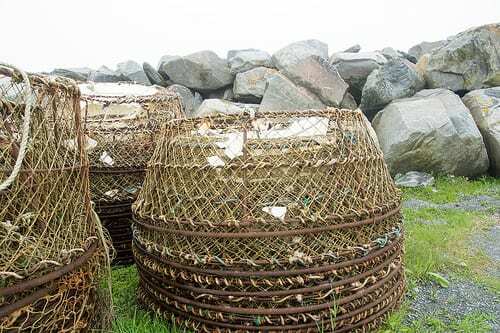 You have explored the topic sufficiently to realise that this is time for a serious trial, and for an investment of some time and money to find out if it is worth proceeding further. You set up your first Knowledge Management pilot program, to see if it works in your company, to see how it works in your company, and to see if it adds value, and if so, how much. To see if it “feels right”. If the first date (pilot) works out, then it will be followed by the second, and the third, and so on. In older more sexist days, this would be “asking her father for his daughter’s hand in marriage”. Nowadays it is less of a hurdle, but there is a point where you need to declare your relationship with others in your circle of family and friends, and discuss the next stage. In Knowledge Management terms, this is when you involve senior management. You discuss the pilots, you discuss the value, and you negotiate whether, and how, and when, you can make the relationship with Knowledge Management official. Senior management may need more evidence, or more pilots, but if you have a good enough business case and enough value stories from the pilots, they will be on your side. That’s as far as I want to take the analogy at the moment, and we can leave the happy couple setting off on the honeymoon together. How well distributed is your KM budget? There are 4 legs on the Knowledge Management table. Are you investing evenly in each of them? Knowledge Management requires equal attention to the four key enablers of People, Process, Technology and Governance. The test of whether you truly are paying equal attention is whether your KM program investments equally in these four crucial elements of the KM Framework. Most of the time, we find that the companies we speak with spend far more on technology than on the other elements, and most of the time we find that their Knowledge Management program suffers as a result. Technology alone will not deliver knowledge management, and an overspend on technology is usually a bad strategic move. This is a more equal spend than we see in many organisations, but there still seems to be an under-investment in process (process definition, process trial and testing, ad training in KM processes. We are happy to say that this KM program is still very much alive and well and delivering value 12 years later. A balanced spend seems to have contributed to their success.